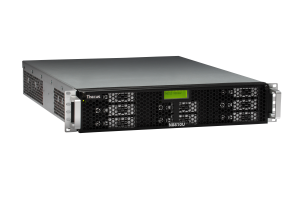 Thecus is pleased to announce the expansion on the company’s SMB and Enterprise NAS line with the 10GbE Ready N7710 and N8810U. These new models offer identical hardware and performance to the recently released N7710-G and N8810U-G, differing only in stock support for 10GbE connectivity. Under the hood of each is an Intel® Pentium® G850 Dual Core 2.9GHz processor and 4GB of DDR3 ECC RAM, expandable up to 32GB. Both models also benefit from the balanced strengths of RAID 50, while the N8810U offers the enhanced reliability of RAID 60 as well.